J’s room underwent a DIY upgrade last summer and ended up looking like one of those display rooms in Ikea. Not surprising, as almost all the things that went in came out of a whirlwind shopping spree at Ikea. Right from the very blue pendant lamp to his ‘big boy’ bed. Which brings me to the reason behind this post. Once everything was assembled and put into its rightful place in J’s room, we were left with a truckload of packing material. From bubblewrap to plastic covers to cardboard boxes. Most of it ended up in landfill, sadly, as nobody seems to know what to do with bubblewrap and plastic sheets when it comes to recycling. Nobody wants to so much as touch them with a barge pole. The paper and most of the cardboard did go in to be recycled. All we were left with was one large cardboard box, which had housed the various planks and pieces that are now J’s bed. It too would have found itself being pulped into a newspaper or some such. The only reason it ended up with a different fate was because our paper-recycling bin was bursting at the seams. So we held on to this great big cardboard box and hoisted it in the hallway along the stairs. And there it stayed, as we procrastinated its fate. Until I was struck with inspiration one rainy day when J was being a typical three-year old and I was being a hormonal middle-aged woman. I was looking to keep him occupied, creatively if possible rather than bunging him in front of CBeebies. Is when I thought of this over-sized box of cardboard. In a flash, I was brandishing a pair of scissors and ripping the box open. Voila! I now had a very large double-sided piece of sturdy cardboard. I dashed upstairs to J’s room to fetch his painting things from the now not-so-brand-new Ikea storage solutions. Draped in his art apron, his palette of colours strewn around him, J set to work creating his masterpiece. He started work with a single brush, a pot of water and a cleaning cloth. He went about meticulously cleaning the brush between colours. I watched mesmerised as one brushstroke followed the next. 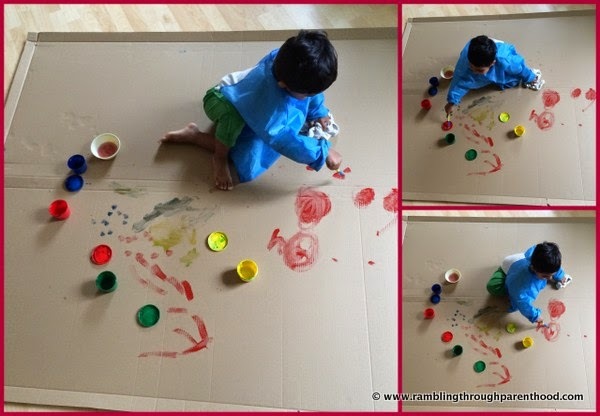 By now, J was sitting on the cardboard, bang in the middle, with his art developing all around him. It didn’t take him long to discard the brush and do what modern artists do. Use his fingers to dab first one colour, then the next, then go on to mix them with flourish. He was learning to create colours without either of us realising what was happening. The mother in me did cotton on before long, and I decided to channel this newfound skill just that little bit. So I told him to dab on some red, and then put some yellow in. What colour did you make? Orange! We continued to make green, brown and purple. J had now had enough of finger painting. So he proceeded to paint with his feet! 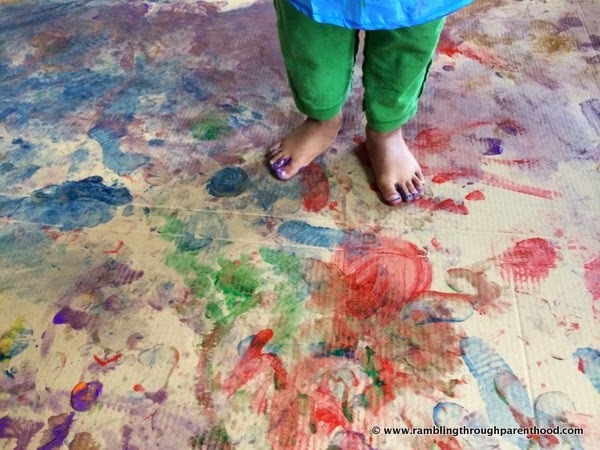 Stomping first here and then there, his little feet leaving colourful prints all over that old cardboard. 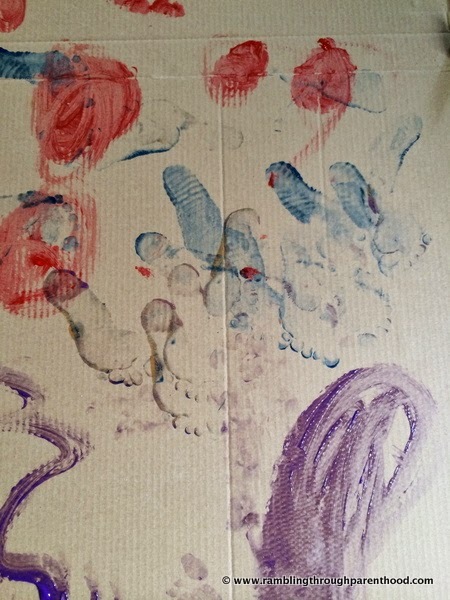 We had never done clay prints of J’s hand and feet when he was a baby. But now I had a whole work of art with my son’s prints all over it. As you have probably guessed, that piece of cardboard has never found its way to the recycling bin. I don’t think it ever will. What a great way to use the box - I hope you have somewhere to keep it now! This is a great idea! 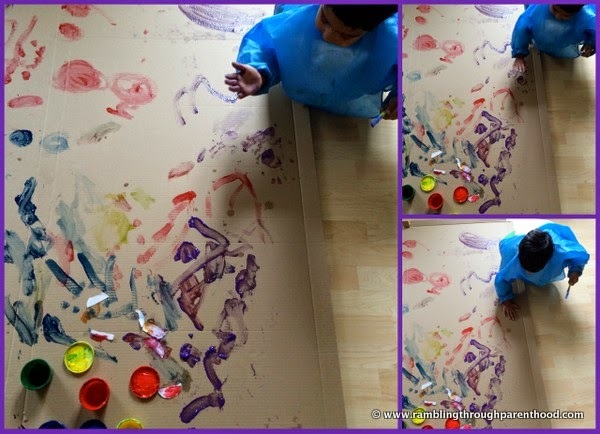 It is great to let them explore and use paint like this. Fantastic! This is such a great way to make use of the box. 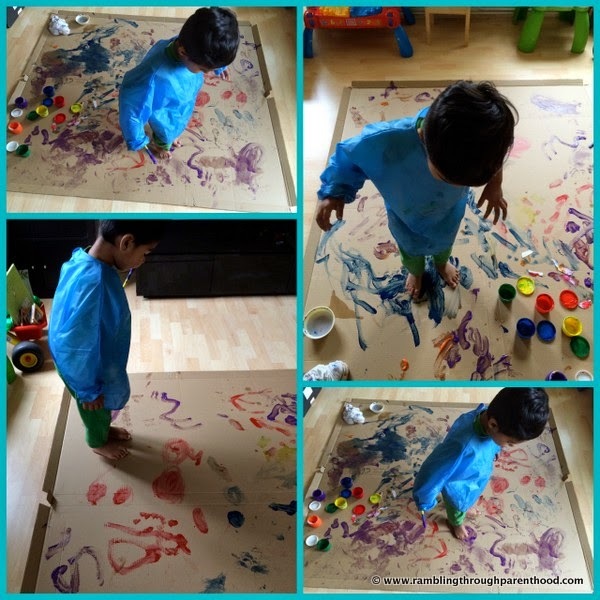 Oh thats so sweet that you let his creative juices flow with his feet and hands.Looks like he had a brilliant time. Looks like such fun! We currently have to large boxes in our lounge- one is a house and one is a castle - I love that Syd is enjoying them so much but am missing having any room to move! 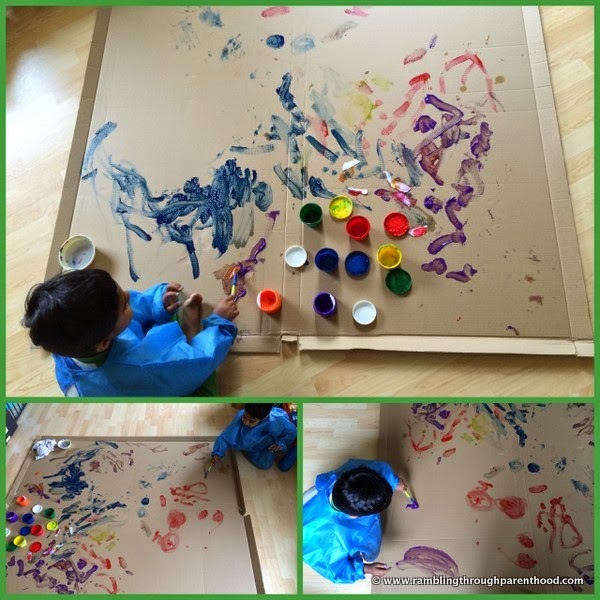 what a great way to explore with paint. What a brilliant idea - and perfect timing just after Xmas when I have a mass of boxes in my utility room!